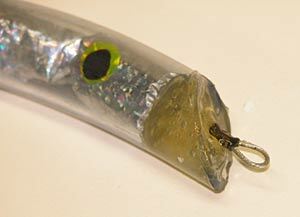 Here is a home-made lure for you to try out and perhaps improve on. 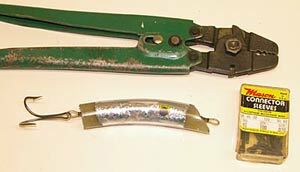 The basic concept is to make a home-made lure that is simple to build, doesn’t require the use of special tools, will cast a long distance, will be durable (won’t fall apart when attacked by a tough fish), and finally is inexpensive to make. Here is my attempt at making such a lure. The finished lure looks a little bit like a fish! Making this fishing lure reminds me of a time one Christmas at French Pass when everyone had lost all their lures on yellowtail kingfish. We all searched around back at the camping ground for stuff to make more lures out off! It worked for a while. In the end we had to make a trip to Nelson for more jigs and poppers. There is nothing more annoying than camping at some isolated place for several weeks and then running out of fishing tackle half way through. The kingfish kept busting us off. We just never expected that we could possibly loose so much tackle in such a short time! I’ve never forgotten the lesson learnt on that trip. Nowadays I always take heaps more than I expect to need – just in case. The outer skin of the Hot Melt Glue Thing is made from 16mm Neta plastic tube. This is readily available in hardware stores. The other main ingredient is hot-melt glue. 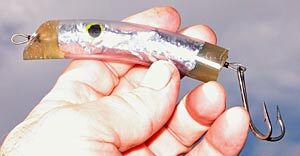 I have use three half ounce sinkers in the lure shown here. As one ounce is about 28 grams that makes the finished lure roughly 84 grams. This is a good weight to cast on a heavy spinning rod. I intend to try the lure on kahawai. Note I have placed two of the ball sinkers towards the rear of the lure to improve casting performance. The components are readily available. The whole process would be scaleable. 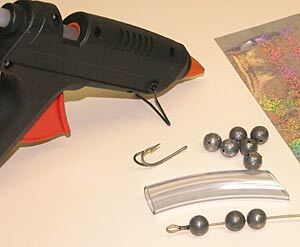 If you wanted to make a trout lure just scale down all the parts with narrower diameter tube, lighter sinkers, and so on. 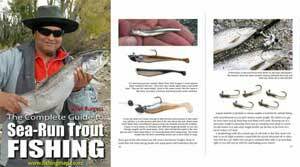 The most important factor to consider with any fishing lure is structural strength. After all you don’t want to hook a really big fish only to have it escape because your lure fell apart! In the lure shown here I have used 150 lb (68kg) Mason Nylostrand Leader Material. This is nylon covered stranded stainless steel wire. It is essential when using this sort of stainless leader to get the correct crimps for the diameter of wire. If you don’t have the correct size crimps the end loops will never be as strong as they should be. Even if the lure itself fell to bits the line through to the fish would still hold. This is an important consideration should you hook a good size tuna or yellowtail kingfish! To begin with I formed a loop at one end if a length of the Mason stainless stranded wire. Then I crimped the loop tight. You really need the proper crimping tool for this job. The best crimps to get are the figure eight crimps with two holes. It is essential to get the correct crimps for the wire. a felt tip pen. I think the eyes are essential to help trigger a strike from a predatory fish! I cut the front end of the tube on an angle as you can see. This is so that the lure will pull off to one side when retrieved then right itself thus creating a fish-like swimming action. That’s the theory. I haven’t tried this particular lure out yet. The ends of the tube were filled with hot melt glue to a depth of 20 mm. This produced a very tough finished product that was quick to make. For heavier lures just add more sinkers. You could also mould a long “rod” sinker to fit. I have used a double hook which has the advantage of not needing a split ring. If I were using a treble hook I think I would crimp this into the loop rather than use a split ring at all. A split ring would add cost and produce a weak point. I have seen kingfish open big split rings before. There you have it. It might not be pretty but it should catch fish. As to how much each lure would cost I’m not sure as I already had everything needed to make them. I estimate that the finished lures should come in under $NZ 2.00 each. On larger lures the saving would be considerable. I’m sure that a few refinements and improvements are also possible. As perhaps also are some areas where costs might be reduced. If you can think of any improvements please send me an email.